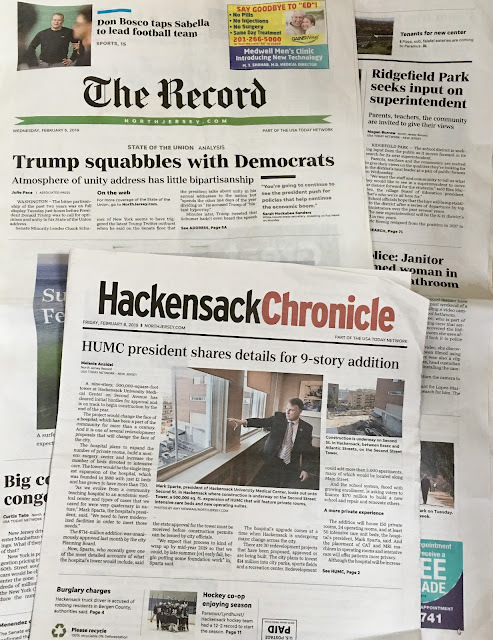 The Record of Woodland Park and the Hackensack Chronicle, a free weekly that no longer has its own staff, and reprints stories and photos from the daily newspaper. HACKENSACK, N.J. -- Readers are fleeing The Record of Woodland Park and NorthJersey.com as if they were a sinking ship. As of Dec. 31, 2018, daily circulation of The Record was 68,630, compared to 91,032 at the end of 2017. The numbers include visitors to The Record's digital news site, NorthJersey.com, Gannett said in its 2018 Annual Report. Sunday readership was 90,352, including visitors to NorthJersey.com, compared to 97,149 at the end of 2017. That's a loss of 22,402 readers daily and 6,797 readers on Sunday in 2018. The Record is listed 8th among Gannett's "major publications and their affiliated digital platforms." That means the once-great local daily newspaper published in Hackensack is ahead (in daily readers) of only The Des Moines Register and the Democrat and Chronicle of Rochester, N.Y., but behind both in Sunday circulation. The annual report lists the location of The Record as "Bergen, New Jersey." Under bylines in the print edition, The Record is referred to as "North Jersey Record." At the end of 2016, readership of The Record and NorthJersey.com was 235,681 daily and 147,609 on Sundays, according to the 2016 Annual Report issued by Gannett, the nation's largest newspaper chain. Gannett bought North Jersey Media Group from the Borg family in July 2016 for $39.3 million in cash. NJMG published The Record, Herald News, (201) magazine, North Jersey.com and about 50 weeklies. More than 350 NJMG employees were laid off eventually. Retaining such veteran columnists as Mike Kelly, Charles Stile and John Cichowski apparently had no effect on keeping readers. The error-prone Cichowski retired this year after writing the Road Warrior column for more than 15 years. Meanwhile, platforms for local news, including TAPIntoHackensack, may be drawing readers away from The Record and NorthJersey.com, which have cut municipal news drastically. Gannett owns a total of 8 newspapers and their affiliated digital platforms in New Jersey, including the Asbury Park Press, Daily Record and Courier News. The 2018 Annual Report gave their combined readership (print editions and digital platforms) of 165,179 daily and 224,703 Sunday. Divide by 8 and those numbers aren't impressive at all. The Record has continued to slip in quality for the past few years. Spelling and grammar errors abound. Getting rid of the local columnists and reporters was a factor in the decline in readership i’m Sure.